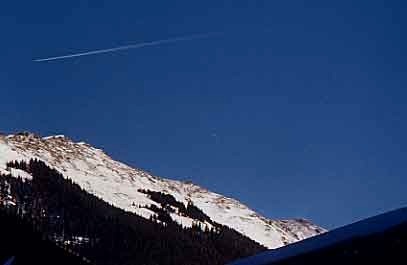 We left Tucumcari early Sunday morning with our goal to view the Taos ski area. Picked up our first ding on our new car just west of Tucumcari from a stone kicked up by a pickup truck. We will need a new windshield. It was a Marlboro man - we left him alone. Checked in at Sante Fe about eleven AM and unloaded our car for its first climb up a mountain. We headed for Angel Fire, Taos, and Eagle Nest Lake. Always very serene looking from 35000 feet but kind of tacky in the close-up real world. Continued up and around the Taos Mountain to Eagle Nest with twisting and turning through the forest. The view below is looking south from the village of Eagle Nest towards the Angel Fire ski area. Have crossed over this area hundreds of times. We had lunch down the road just north of the ski area. We back tracked around the mountain, back to Taos and found the county road 150 to the ski area. A beautiful drive through more forests to the Taos Ski Valley as viewed below. Many black diamonds overlooking the main lodge. Taos ski valley. Al passing overhead again. 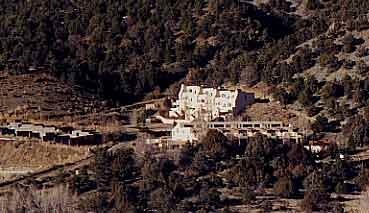 After Bev bought a sweat shirt we joined the Sunday afternoon rush down the hill and back to Santa Fe NM. 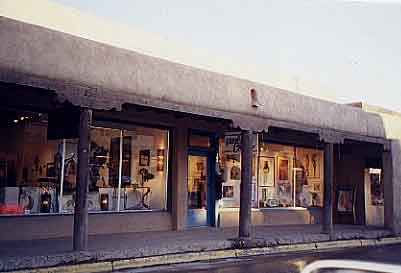 Shops in the Village of Taos.